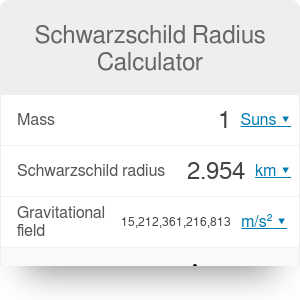 The Schwarzschild radius calculator lets you obtain the gravitational acceleration on the surface of a black hole, also called the event horizon. Due to the nature of black holes, both the event horizon (also called Schwarzschild radius) and the black hole gravity at this point can be calculated from just the mass of the black hole. We will also explain below what is the Schwarzschild radius and what the black hole equation means. Put simply, a black hole is what happens to a star when its mass is so big that nothing can stop its internal gravity from compressing all the material that make up the star. When this happens, the mass density and gravitational force inside the black hole is so strong the laws of physics as we know them cannot explain what happens there anymore. The gravitational field inside a black hole is so strong that not even light can escape from it (hence the 'black' in black hole). The separation between the region where we know how things work and the region where we don't is called the event horizon, and in a black hole it is also known as the Schwarzschild radius. Despite all this, a black hole behaves like any other massive object when seen from far away. A black hole attracts other objects with mass with a force that can be calculated using our gravitational force calculator just like any other object with mass. Another useful quantity to study massive objects is the gravitational field or gravitational acceleration which is the acceleration that any object would experience due to the presence of our massive object, in this case of a black hole. In a general situation, you can easily calculate the gravitational acceleration by simply using the gravitational force calculator and setting one of the masses to 1 kg. This is the valid approach to calculate the gravity from a normal object or even the black hole gravity at a point far away from the surface of the black hole. However, there is a point of special interest for black holes called the event horizon or Schwarzschild radius (that be understood as the surface of the black hole) which is exactly where this calculator becomes the most useful to calculate the black hole gravity. Let's see now what is the importance of these points and how this black hole Schwarzschild radius calculator works. The event horizon is a very important concept when talking about black holes. In this Schwarzschild radius calculator, we can easily compute where it is located. The event horizon is the point (or a collection of points) in space that divide two areas that cannot communicate back and forth. In the case of a black hole it is the point where the escape velocity is the same as the speed of light c.
To learn more about escape velocity you can check the escape velocity calculator but put simply, it is the speed required to get away from the gravitational pull of an object. The event horizon of a black hole divides the points the region of space in which light can still escape the attraction of such a massive object from the points in which nothing, not even light, can resist the pull of the black hole. This means that effectively everything that falls inside the event horizon is "lost forever" and we can never recover it (though some research suggests there might be exceptions to this rule). Because of this effect, the event horizon is usually considered informally as the surface of a black hole. The event horizon in a black hole is also called the Schwarzschild radius, after the physicist that first introduced this concept. For a non-rotating black hole, it depends only on the mass of the black hole, which makes this black hole event horizon/ Schwarzschild radius calculator very easy to use as it only needs one input parameter. M Mass of the black hole. Typically a very big number, expressed in thousands of solar masses (at least). r Schwarzschild radius / event horizon / black hole radius. This parameter is calculated using the same equation as in the escape velocity calculator using the speed of light in vacuum and the aforementioned mass to obtain the distance at which the escape velocity is exactly c.
g Black hole gravity at the surface. This is the value of the gravitational field at the event horizon. It is calculated by the same equation as in the gravitational force calculator, setting one of the masses to 1 kg and the other being the mass of the black hole and taking the distance r to be the Schwarzschild radius of this black hole. Schwarzschild Radius Calculator can be embedded on your website to enrich the content you wrote and make it easier for your visitors to understand your message.